Chava Mark, whose husband Michael was killed in shooting Friday, stable but serious; IDF locks down Hevron area in hunt for killers. The condition of terror victim Chava Mark, who was seriously wounded in Friday's shooting attack south of Hevron, continues to be serious, but stable. Chava's husband Michael, 48, was murdered in the attack, and two of their children were wounded - one moderately and the other lightly. Michael's funeral will most likely take place tomorrow (Sunday). Professor Avi RIvkind, head of Hadassah Ein Kerem Hospital's Trauma Unit, told reporters Saturday that Chava was operated on by a number of different medical teams for gunshot wounds to her upper body. She will soon be transferred to intensive care. He added that despite her life no longer being in danger, the victim is still in serious condition, and the long-term effects of her extensive injuries will not be fully known for some time. 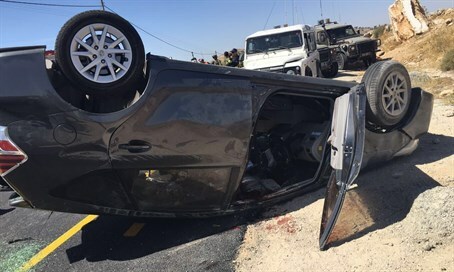 As mentioned above, the couple's 15-year-old son was also admitted to hospital with light injured, which he incurred after their car flipped over when the terrorists overtook it and fired some 20 rounds. Their 14-year-old daughter - who suffered gunshots wounds in the attack - is in stable condition and making a steady recovery; she is set to be discharged from hospital in the coming days. Following the attack, IDF forces sealed off the entire Hevron region, as the hunt continues for the terrorists responsible. It is the first such large-scale lockdown and major military operation in the area since the 2014 operation to locate three kidnapped Israeli teenagers, who were later found murdered by their Hamas captors. The Government Security Cabinet will meet tonight at 10:00 p.m. to discuss further measures in response to the attack.